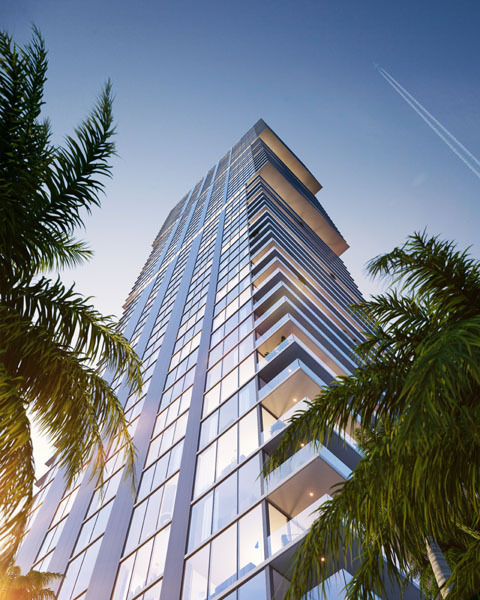 From the very first moment you encounter Elysee Miami, it’s clear that the luxury tower is a once-in-a-lifetime residential destination. 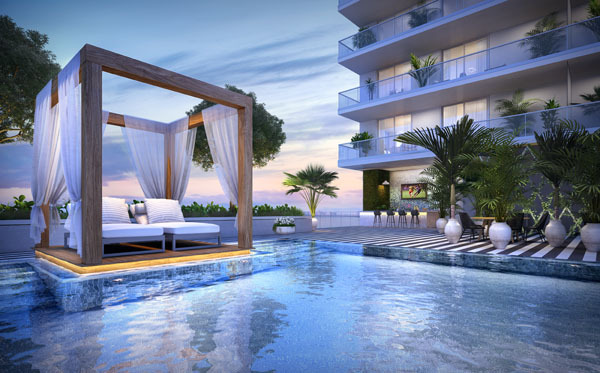 However, it’s the combination of many exclusive ONLY-AT-ELYSEE features that set the property apart from all others in South Florida. 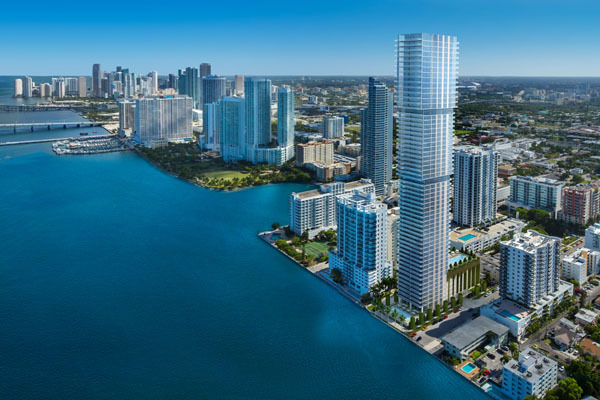 Elysee is being developed by South Florida-based Two Roads Development in downtown Miami’s elite East Edgewater enclave, a fast-growing bayfront neighborhood situated east of Biscayne Boulevard and between the Venetian and Julia Tuttle causeways, with Biscayne Bay to the west. 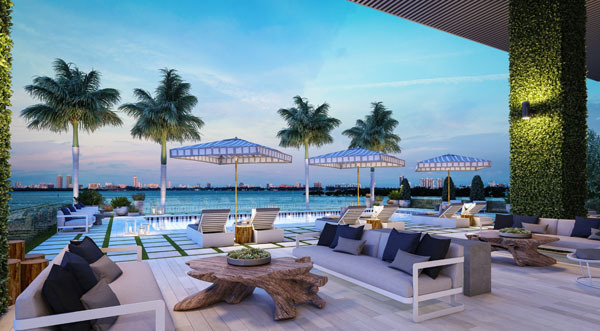 The surrounding Miami Design District, Wynwood Arts District, Midtown, MIA Airport, Miami Beach and Brickell neighborhoods are all within easy reach, providing the top destinations for luxury shopping, high-end dining, world-class arts, culture and entertainment. 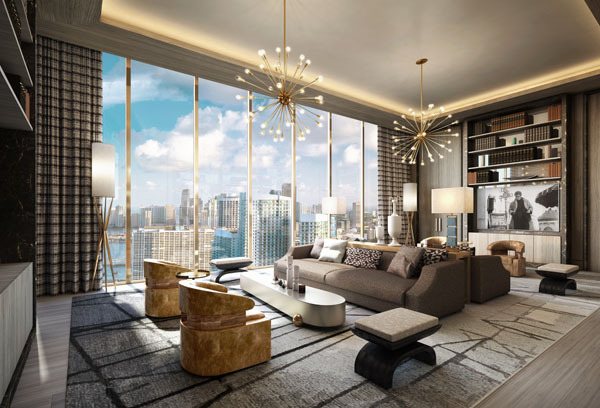 With only 100 half-floor and full-floor residences, the 57-story boutique-style tower will include three- to five-bedroom residences measuring between 2,300 and 4,000 square feet. The tower’s distinct three-tiered telescoping shape will provide direct, unobstructed 180-degree bay and city views from every residence. Elysee’s unique design was created by world-renowned architect Bernardo Fort-Brescia of Arquiectonica and highly praised French interior designer Jean-Louis Deniot. Fort-Brescia created the slender glass tower, making it the tallest residential high-rise in the East Edgewater neighborhood. 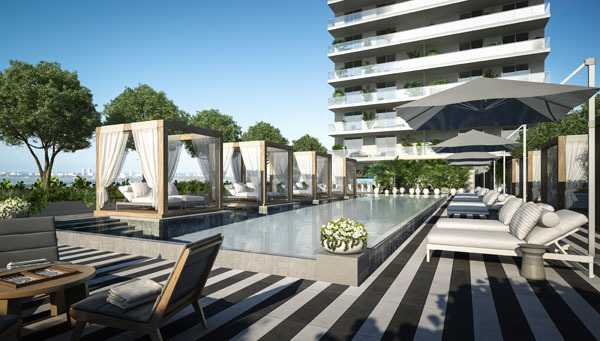 Elysee embodies tasteful elegance along the Miami skyline that will amaze onlookers. Not only is the exterior of Elysee stunning, but the interior has the same sense of taste to match. The timeless elegance created by Deniot takes a dip into different time periods while never being cliché. Each room is designed to make people feel as if their residence was created just for them. Elysee was designed to make people enjoy being there, proud to live there, and to make residents feel as if it’s their own treasure. The vision was to create a building that felt like a grand house rather than just another apartment building. 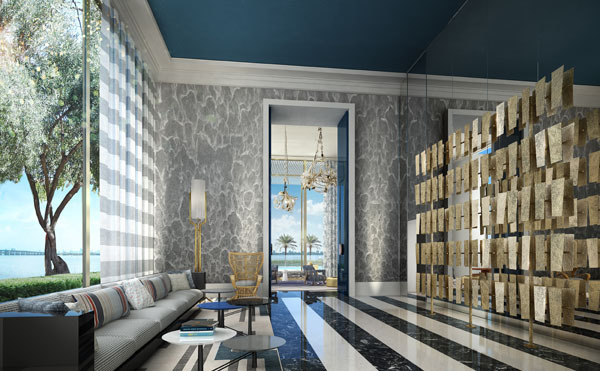 Elysee has amenities that buyers find enviable on the lobby, 7th floor and 30th floor. These amenities enhance residents’ lifestyle and provides an unlimited amount of luxury . With continuous flow and remarkable design each floor has a distinct purpose. 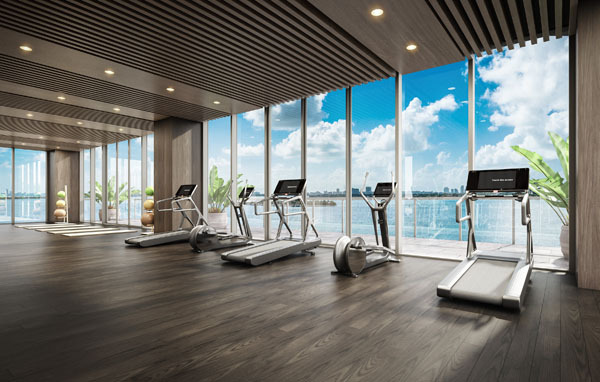 Amenities on the lobby level and 7th floor include two resort style pools, a health club featuring a fitness center, yoga studio and spa with sauna, steam and shower facilities and private massage rooms, a children’s playroom, and a blow-dry bar, . 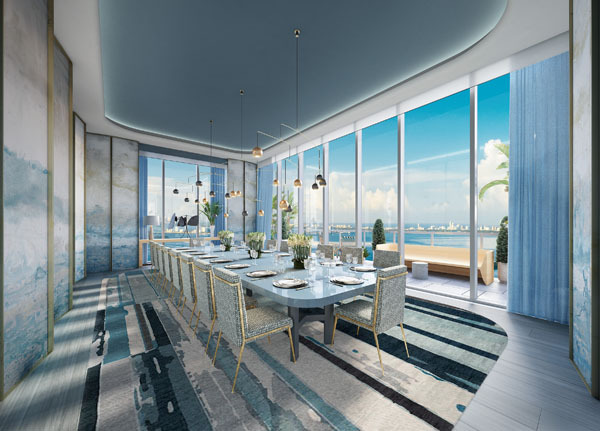 On the 30th floor, the sky lounge offers stunning 360-degree views of Biscayne Bay, the ocean, downtown and much of the Miami skyline. This amenity rich floor It is equipped with a grand salon, full bar, dining room, private theatre/media room, chef-grade kitchen and even a teen lounge. The 30th floor is one of the most breathtaking offerings by Elysee and is also a perfect place to host get together, cocktail party, or an intimate place to cuddle up and watch a movie or read a book. 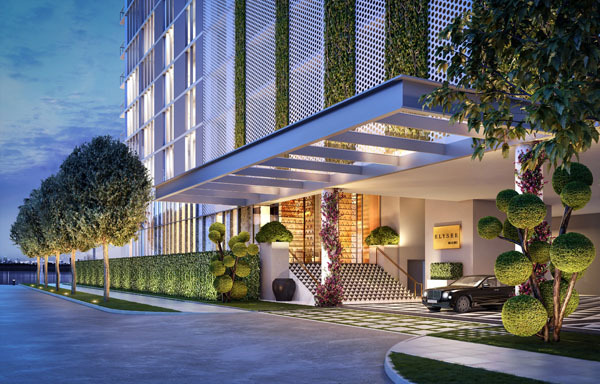 A most sought after offering from Elysee is that residents will have access to Luxury Attaché, the premier concierge and lifestyle management company, catering exclusively to the elite. Among the first of its kind to operate on a business-to-business model, Luxury Attaché has set the standard for personalized service across the country, offering access to an unrivaled repertoire of lifestyle expertise. Luxury Attaché services include: restaurant reservations, access to trusted child and pet care services, superior housekeeping services, private chef coordination, premium tickets to shows, travel coordination, among many other services. With all there is to enjoy that can ONLY be found at Elysee Miami, residents have access to everything they need and more. Unit prices range from approximately $1.5 million to upwards of $14 million.